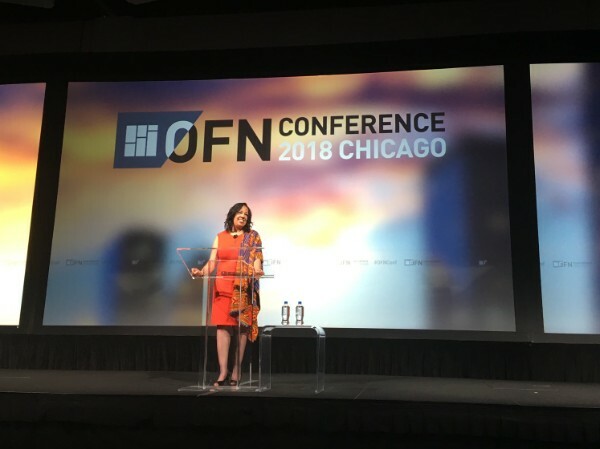 Making inroads in Chicago, an OFN Conference recap. Last week, CEO, Sean Daniel Murphy, Director of Regional Strategy and Partnerships, Ingrid Jacobson, and Investment Associate, Rasheed Mitchell joined the CDFI community for the Opportunity Finance Network's annual conference, held in Chicago. At the three day event, the team had opportunity to meet with other CDFI leaders, talk investment strategies, discuss best practices, and more. Sean Daniel Murphy, Michael Jeans, and Catherine Howard on a panel at 2018 OFN annual conference. Sean hosted a panel discussion with Catherine Howard of the Northern California Community Loan Fund (NCCLF), and Michael Jeans of Growth Opportunity Partners in Cleveland, titled "Beyond micro-lending: using collaborative growth capital and support to build inclusive economies in which no small biz gets left behind". The panelists discussed how CDFIs (Community Development Financial Institutions), like ICA Fund Good Jobs, can make a real impact on often overlooked, undercapitalized, and under-served small businesses, by working together to build capital stacks, mitigate risks, and collaborate in all phases of the investment process. The trio also shared strategies, challenges, and learnings for making this sort of work happen. Earlier this year, Opportunity Finance Network CEO, Lisa Mensah visited our headquarters in Oakland. After meeting with Sean and members of the ICA Fund Good Jobs team, she toured two of our investment portfolio companies, Firebrand Artisan Breads and Impact HUB Oakland. In Chicago, at the national conference, Lisa talked about her experience from that day in Oakland – from enjoying a cappuccino at Firebrand, to meeting the employees of our companies and learning the deep impact of our work – much of which she shared with the keynote audience. Older PostJoining forces with SOCAP to Bridge the Bay Area.